2 How Does a Kerosene Heater Work? 6 Why Buy a Kerosene Heater? 7 Are Kerosene Heaters Dangerous? 8.1 Can you get carbon monoxide poisoning from a kerosene heater? Many people choose to use kerosene halters when they are a more suitable alternative to other kinds of space heaters that are available. If you have a large garage for example and have nowhere that you could plug an electric garage heater into the electric supply, you may want to choose kerosene heater as it would be a more possible and instant solution. This would also save you the expense of having to have an electrical supply installed in your garage. If you don’t need a long-term heating solution, or if you don’t even need supplemental heat, it can still be a good idea to have a kerosene heater available for your household. If there were a natural disaster or a power cut, for example, having a kerosene heater on hand would be useful. As there are so many different models for you to choose from, we have included some kerosene heater reviews so that you can find out what is available. Our buying guide will also help you to choose the best kerosene heater for your home. The Mr. Heater F270320 MH125KTR is a fan forced kerosene heater that is capable of heating particularly large areas of up to 3125 square feet. This is an impressive amount of space and you would struggle to find a heater that used an alternative form of fuel that could heat an area this large. The heater has an 8.5-gallon fuel tank capacity. Even with the amount of warmth that this heater generates, you can be sure that this appliance will be able to last for up to 15 hours before it would need you to refuel the tank. 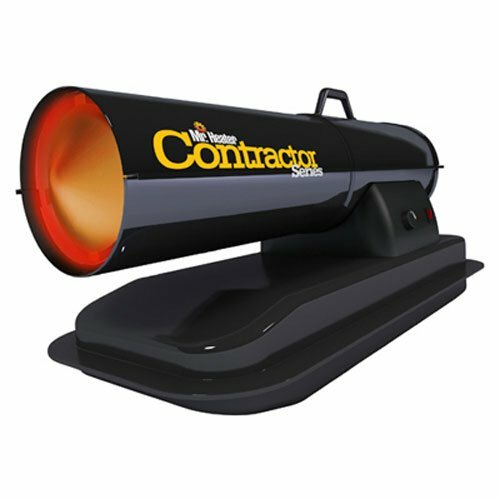 The high output fan will ensure that the heat is distributed evenly and quickly throughout your workspace. The heater also includes a power indicator light so that you can tell easily if it is on or off. For maximum safety, this heater features sensors to detect if the flame has gone out or for overheat protection and will auto shut-off in these events. So that you can move this heater around easily, it has large pneumatic tires. Even when the tank is full, you will not struggle to move this heater around regardless of your strengths or abilities. In addition, there is a compartment for the cord to be stored. You can control the temperature of this heater using the thermostatic control. For peace of mind, you will receive a 1-year warranty on this heater from the date of purchase. For reliability, the best possible heating performance, and completes durability, you should choose the Dyna-Glo KFA125DGD heater. This is a high-powered kerosene heater that offers a powerful 140,000 to 180,000 BTU heat output. It can heat up an area of up to 4,200 square feet for up to 10-12 hours on a full tank of fuel. The 10-inch wheels allow you to move this kerosene heater sound with ease. As the wheels are anti-puncture, you can be sure that they’ll require no maintenance, and you will be able to move this heater around without any difficulty, even with a full fuel tank. It also has handles that are easy to grip and they are also tall so that the heater will not put too much strain on your back when you are moving it. This heater features a fuel gauge to let you know how much fuel is remaining in hours. It also has an air pressure gauge to allow you to adjust the pressure easily. The steel drain plug that is included with this heater means that there are no perishable parts in the drain. Other heaters usually have rubber on the drain plug to maintain a tight seal however this can often perish easily. If you want kerosene heater that is easy to use, cheap to run, and efficient, you need to consider purchasing the Mr. Heater F270270 MH75KTR. This heater will warm up your space instantly so that you won’t need to wait for the room to become warm. This convenience is greatly appreciated, especially if you are working and time is important. On a full tank of fuel, this heater will operate for about 11 hours before you need to add more fuel to the tank. In addition, it’s can offer your room a fixed heat output of around 75,000 BTUs. This means that this powerful heater can heat an area of around 1875 square feet. Blue the easy of the access panel, 6-gallon fuel tank, and overheat safety shutoff are just some of the great features that this kerosene heater has to offer. It is also CSA certified for safety and uses a continuous ignition for an easy start. Although this heater does have a carry handle at the top, it does not have any wheels. If you have the 6-gallon fuel tank full and you wish to move this heater, it may be a little heavy and difficult to move at times. This is one of the only drawbacks of this high-quality and powerful Space heater. This heater is one of the best choices out there when you want a central heat source that is capable of heating a room in a 360-degree radius. Instead of using other fan forced or cabinet heaters, this one will output heat in all directions so that you can enjoy the maximum coverage throughout your space. 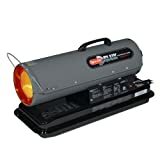 With an output of 23,000 BTUs, this heater kicks out a lot of heat and it is the perfect solution when you want an emergency backup heat source for winter power cuts and any emergency situations where you may require a portable heater. Before you move the heater anywhere, it is important that you remember to drain any fuel out of it for safety. It is recommended that you do this with any kerosene heater. The Dura Heat Convection Kerosene Heater is safe to use indoors and it comes with some safety features too. If it is tipped over, it will automatically shut off. It also heaters a drip tray so that kerosene won’t leak into your room. This heater can warm a room of up to 1000 square feet and does not need an electric supply. 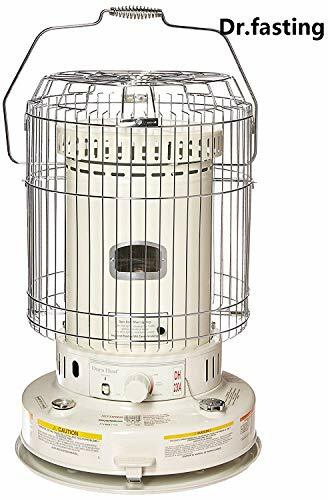 It features a white finish and there is a metal cage-style guard around the heater to prevent anything from touching the heat source at the center. 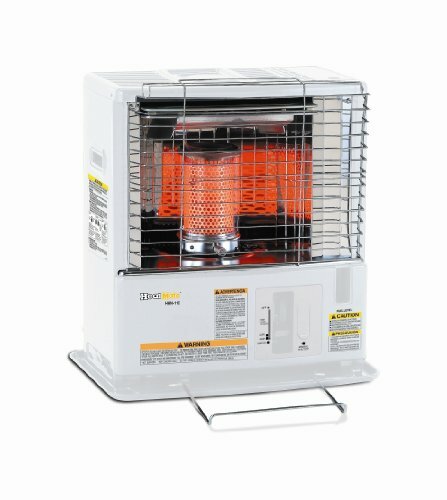 Whether you want a cheaper way of zone heating your home or if you simply need a backup heating solution for power cuts in the winter months, you should check out the Sengoku CTN-110 KeroHeat 10,000 BTU Portable Radiant Kerosene Heater. 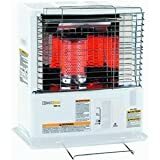 This heater is highly portable and has a small size, but despite being compact, this is a powerful 10,000 BTU heater that is able to heat larger rooms in your home. The 1.2-gallon fuel tank allows you to run this heater for up to 14 hours without needing to refuel, offering you convenience when you need it. It comes with a siphon pump so that you can empty the tank when you want to move or store the heater and it also comes with 4 C sized batteries, which are required for operation. For safety, this heater comes with several inbuilt safety features. The automatic shut-off switch will ensure that the heater will switch off if it is tipped or if it beings to get too hot. There is also a safety protection guard to the front of the heater. The automatic ignition and the flame adjuster ensure that this heater is as easy to use as possible. For heating smaller rooms in your home, this Heat Mate HMN-110 Radiant Kerosene Heater is a great choice. It has a 10,000 Btu output, which is capable of heating room of up to 380 square feet. To ensure complete safety whilst you are using this heater, its features an automatic shut off switch and a tip over Switch. The anti-tip over switch ensures that the heater is turned off immediately if it detects that it has been knocked over. In addition, there was a safety protection guard that is integrated into the front of this heater. The fuel tank has a 1.2-gallon capacity. This is capable of heating your room for up to 14 hours before you need to refuel. You can empty the tank easily thanks to the siphon pump that is included in this heater. You will also receive 4 C sized batteries. An easy to read fuel gauge and automatic ignition makes this a convenient heater for your home. Whether you’re looking for a heater to provide supplemental heat to one room in your home, or if you want backup heating solution for winter power outages, this heater may be the perfect choice for you. A kerosene heater features awake at the center of the heater. The way is the kerosene that is poured into the fuel tank and once this kerosene has been absorbed, a primary combustion process can occur. In order for the kerosene to be lit, there is a special ignition plug that makes the kerosene vaporize and then it can create flames and burn. This is how heat is generated. A mechanical control that is integrated into the center of the burning units allows the amount of air entering the base of the heater to be increased or decreased. In addition, the amount of weight that is exposed to the heater can also be altered. Both of these factors affect the height of the flame and the amount of heat that is produced. 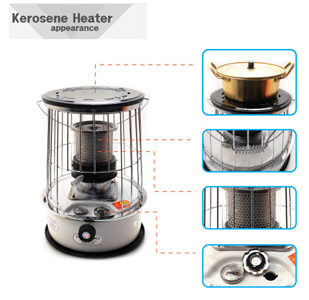 The kerosene heater has a wick that is usually circular in shape. The wick is made of either cotton or fiberglass. It is possible for the kerosene heater to warm up items that are nearby by using either radiation or convection heating methods. Kerosene heaters that are designed to heat larger areas often use a blower fan to disperse the heat further out into the room. Lowering the wick out of the burner turns off the heater, and this extinguishes the flame. When you are choosing the best kerosene heater for your home or workplace, you should ensure that you know what to look for and what safety methods you should follow. When you are looking for different kinds of possible kerosene heaters, you’ll notice that there are two main types. You can find convective and radiant kerosene heaters. Convective kerosene heaters have usually got a round shape. This allows the heat to be dispersed by 360° so that your entire room can be heated. The fuel tank of a convection heater is usually hidden beneath the wick. This positioning of the fuel tank allows the wick to abs all fuel so that it can be burned in the combustion chamber above. Convective kerosene heaters are made for large areas or they could even heat several rooms in your home at a time. They should be positioned in a Central location so that they can circulate upwards and outwards in all directions from the heater. You should never use a convective kerosene heater in your bedroom or in a similar enclosed space. If you have a smaller home however and you keep all of the doors open, you will probably be able to keep a medium-sized home warm throughout with just one of these heaters. 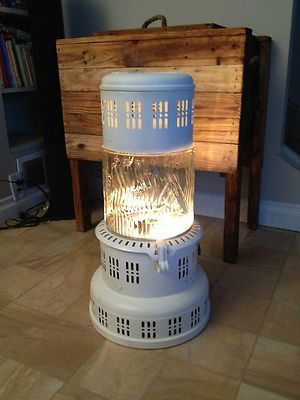 Radiant kerosene heaters are generally rectangular in the shape. These ones are designed for smaller areas and convective heaters. Rather than emitting heat in all directions, these kinds of heaters directly towards people or objects that are in close proximity. To disperse the heat around the room better, some of these kinds of heaters have I found built into them. Some radiance models of kerosene heaters feature a tanker can be removed. This allows you to leave the heater where it is without needing to empty the fuel tank. The fuel tank and then be taken to a safe location so that the fuel can be stored away from your home. It is a good idea to ensure that the heater that you choose comes with a battery operated igniting device. This means that you won’t need to use matches to try to ignite the fuel. Using matches can be a dangerous way of starting up your kerosene heater. If you are going to use a kerosene heater in your home, you will notice that there may be a lingering kerosene Oder when you enter your home. When the heater was in use, however, you shouldn’t notice any unpleasant smells or smoke. This is a sign of a good kerosene heater. You will notice that kerosene heaters can emit a strong odor after they have been turned on or off, Or if they run out of fuel. It is important to keep an eye on the fuel gauge. When you buy your kerosene heater, you should ensure that it comes with an easy to read fuel gauge so that you will know exactly when you need to refuel. One of the main dangers of using a kerosene heater in your home is the danger of carbon monoxide replacing the oxygen in the air. Carbon monoxide poisoning is a very real and dangerous risk. It is important if you’re going to buy a kerosene heater for your home, you should also buy a carbon monoxide detector at the same time. You should also ensure that you would be able to place the kerosene heater in a location that is well ventilated. Ventilation is key when you are using any heating methods that could produce carbon monoxide. Adequate ventilation will ensure that oxygen can enter the room and that’s carbon monoxide can escape. If you simply want to eat one room in your home such as a bedroom, you may need to rethink your choice of Peter. Kerosene heaters are not a good option for heating smaller rooms or rooms where you will be closing the door and all of the windows. When you buy your kerosene heater, you should make sure that it has all of the safety features that you need in order to feel safe. Overheat protection Will ensure that the heater will turn off if it detects that it is too hot. This will not only protect you, but it’s will also prolong the life of the heater. An anti-tip switch is essential for kerosene heaters. If you have pets for small children, the risk is even more increased that’s the kerosene heater could be accidentally knocked over. Even in the best of circumstances, it is not impossible for kerosene heater to be tipped over. To prevent the combustion of leaking fuel, it is important to have a safety switch that will turn the heater off if it is knocked over. As already mentioned, it would be a good idea to have a carbon monoxide detector installed in your home or workspace so that you know if the oxygen level drops too low. In order to be able to leave your heater indoors when you are not using it, you should look out for their kerosene heaters that have a removable fuel tank. This means that you will not have two try to empty the tank before you move it. Instead, you can simply disconnect the fuel tank and take it with you so that it can be stored off your premises. You should ensure that the kerosene heater that you choose is easy to fuel. You will need to fill their heater outside before you can use it. Make sure that you will be able to carry their heat outside easily and that it will not be too heavy once it has been filled with fuel. You will need to think about how long the tank of fuel will last before you need to refuel. Refueling can be a lengthy process, as you will need to wait for the heater to call down properly before you can refill it. For this reason, you should choose a heater that will be able to hold enough fuel to heat your room or space for as long as you need it to. You will also need to be able to store your heater when you are not using it. Make sure that you take notes of the measurements before you buy a heater and measure the area that you have to store the heater in. Remember that you will also need to store containers of fuel along with the heater so you will need to make sure that there is enough room for this too. You should only purchase a kerosene heater if you can be sure that you have enough room to store their heater and their fuel away from your home for safety reasons. If you have a garage that is not connected to your home, this would be the perfect place to store the heater and any fuel that you may need to purchase. You could also use a basement, however, this could be dangerous if the kerosene was to catch fire as heat rises. Remember to check the manufacturer’s guidelines before you make your purchase so that’s you know if the kerosene heater will be suitable for your needs. It is quite possible to use a kerosene heater indoors, but if you do you should make sure that you follow some important safety guidelines. when you are filling your kerosene heater with fuel, you should ensure that it is always turned off. You should also never fill the fuel tank if the heater is still hot. You should also avoid filling the fuel tank is their heater is not at room temperature. Remember to take the heater outside in order to fill the fuel tank. Fill the tank away from anything that could set on fire. Only ever fill the fuel tank to the maximum level and don’t overfill. you must make sure that you place your kerosene heater in an area that is well ventilated. Do not place your kerosene heater near any furniture curtains or in any footpaths. Keeping the heater away from your walkways will reduce the chance of it being tipped over. You should ensure that you have a carbon monoxide detector, smoke detector and a fire extinguisher in your home. They should all be tested frequently so that you will be safe when you are using your heater. 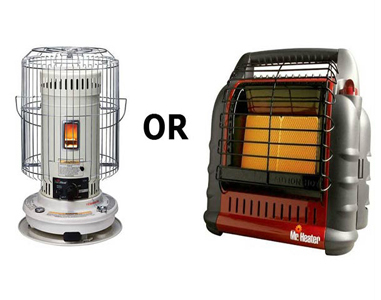 When it comes to portable space heaters, portable propane heaters and kerosene heaters are certainly the most popular. Each of these fuel types comes with their own advantages and disadvantages, however. Propane is a clean-burning fuel and as a result, it is more popular in homes than kerosene heaters. This fuel produces low emissions, making it more environmentally friendly. Propane fuel is heavier than air and it is usually compressed into tanks. These tanks are sold at filling stations or hardware stores. One of the main problems with propane is that it is very combustible. When it is inhaled it can be dangerous for health. Kerosene fuel, unlike propane, is in liquid form. This means that it can’t leak the same as propane can. On the other hand, so it does create small emissions than propane and as a result, it is worse for the environment. Kerosene is capable of producing a lot of heat quickly and can generate more heat in a single gallon of fuel. When you consider the fact that propane costs more per gallon, kerosene is a far better fuel to use if you are concerned about value for money. It costs around $2.25 per gallon of kerosene and $3 per gallon of propane. Why Buy a Kerosene Heater? A kerosene heater is a great appliance to have in your home. There are many reasons why you may want to choose a kerosene heater and these are just some of them. You can save money on your heating bills by using a kerosene heater to provide supplemental heat. You will be able to general central heating system off and just use the kerosene heater in the room that you are occupying. If there is a power cut in the wintertime, you will be able to use your kerosene heater to provide much-needed heat. 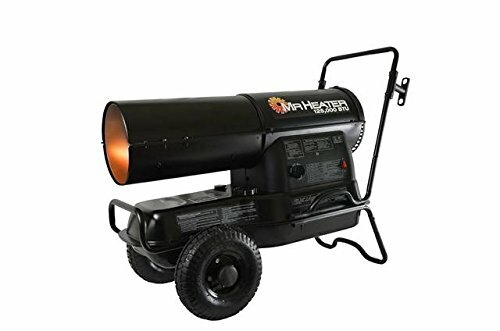 When you are working on our job site and require heat to be able to stay warm and carry out your job effectively, a kerosene heater may be the perfect solution. As they are so portable, you can take them from one job site to another with ease. They also provide instant heat so that you do not need to wait for them to warm up. 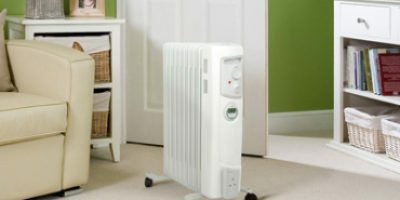 Kerosene heaters are capable of heating far larger rooms than most other heater types. 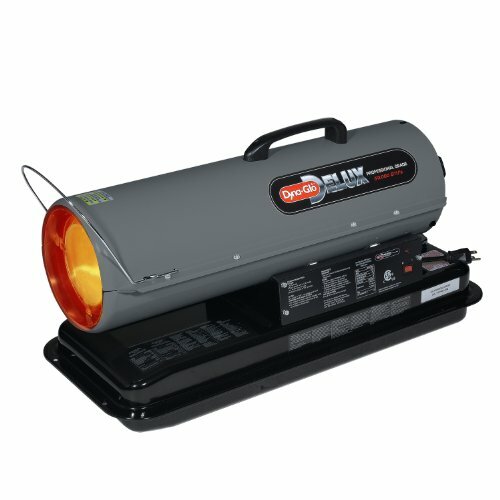 As these heaters often have a fan, they can heat areas of 4,000 square feet or higher, making them a popular choice for events and warehouses. Kerosene heaters are designed to be as safe as possible when they’re used correctly, however, these are still powered by kerosene, which is a combustible fuel and as a result, it is important to use them correctly so that they are not dangerous. Fire – in 2010, it was reported that space eaters were to blame for 32% of all home fires close by heating appliances. The main reason why these fires occurred was that the user placed the heater too close to combustible items. You should be sure to keep your kerosene heater away from curtains and any furniture. Check the instructions that come up with your heater to find out how much clearance you need to give your appliance. Explosion – although it is safe to use the kerosene heater without any risks of explosion, you should be sure to always use kerosene 1K-grade fuel. If you use gasoline instead of kerosene, this is when your heater is likely to produce an explosion. If you keep kerosene and gasoline on your property, you should be sure to keep them both separates and label them clearly. This will avoid any confusion. Burns – before you refill your heater, you must always ensure that you that it fully cool down. If you try to fill a hot heater with fuel, a flare-up can occur and this can burn the user as well as anyone standing nearby. You should also stop children from playing near the heater, and ensure that pets are always supervised. It is important that you follow the correct safety procedures when you are using kerosene heaters. Although they are designed to be as safe as possible, these heaters can be very dangerous if you do not use them correctly. First of all, you should only ever use 1K-grade kerosene that is water clear. You should never use gasoline as this could cause our fire or an explosion even in very small amounts. Make sure that you store your kerosene fuel in the kerosene container. You should never use a gasoline can or one that has ever contained gasoline. This will ensure that you avoid contaminating the fuel. You will usually find that kerosene containers are coded in blue and gasoline containers are red. When you are filling your kerosene container with a pump, you should check carefully to make sure that the pump is for kerosene and not gasoline. Many filling stations use a separate Island for kerosene fuel. You should check that any 1K-grade kerosene that you purchase has been certified. Only purchased from an out-licensed dealer, as grades that are not 1K can be bad for your health, as they will release more pollutants into the air. You can’t tell what grade the kerosene is by simply looking. Always make sure that you take your heater outside to refill the tank. You should always turn the heater off before you start filling it. You should also ensure that the heater is fully cool down before you start to fill it. Take note of the full mark, as this is the maximum level that you should fill the tank too. Although there is a little space above the format, this is to allow the fuel to expand without leaking out of the tank. When you are using the kerosene heater, you should make sure that you place it out of the way of walkways and do not obstruct the flow of heat with furniture, curtains or anything that could catch fire. Can you get carbon monoxide poisoning from a kerosene heater? Kerosene heaters do indeed produce carbon monoxide. Other appliances produce carbon monoxide however including gas stoves, candles, and oil lamps. You will find out some kerosene heaters Will make more carbon monoxide than others as no two heaters are the same. The best thing that you can do is to regularly service your heater, keep it well maintained, and ensure that it is always running properly by carrying out frequent tests. When you are using a kerosene heater indoors, you need to ensure that you have plenty of fresh air in your room. Adequate ventilation including opening windows is essential. You should ensure that you have a carbon monoxide detector in your home. These have a test button so that you can press it to make sure that the battery has not run out of the detector. This vital piece of appointments will alert you as soon as it senses an increase in carbon monoxide in the air. You should ensure that you keep all your doors open whilst you are using a kerosene heater. Trying to close yourself into a room by closing the doors and windows is very dangerous when you have a kerosene heater. If your home is very airtight and the air can get stuffy, you should consider a different space heater than a kerosene heater so that you can be sure that you and your family will be safe. With a little simple knowledge, it is possible to keep up basic care and maintenance of your kerosene heater without needing to call a professional. First of all, you must always remember to empty the fuel tank when you are not using the heater. You should take the heater outside to fill the tank and you should empty the tank inside without moving it. Make sure that you wait until the heater has fully called before you empty the tank. Never use gasoline in your kerosene heater. You should also remember to stop kerosene and gasoline away from each other so that the two won’t get confused. When you store your kerosene, you should make sure that you use a suitable container. The container should be color-coded to signifying the type of fuel that is in it. If you have a supply of gasoline on your property, you should do the same with your gasoline. Make sure that kerosene and gasoline fuels are labeled differently and that they are kept away from each other. You should never store kerosene in gasoline container. From time to time, you will need to replace your heater wick. The wick should not be a generic one, but instead, it should have been produced by the same manufacturer as your heater and should be the one to replace the wick that came with your model of heater. For fast, instant and effective heat, you should consider purchasing a kerosene heater. Whilst there are many safety aspects to consider when you are using them, these heaters are great to use in larger areas, or in places where it is not possible to use an electric heater. You should have found some useful information in this buying guide about how to find the best kerosene heater for your needs, as well as some important details about the safety and maintenance of a kerosene heater. As long as you can ventilate your room properly and you can give plenty of clearance to a kerosene heater, this may be the perfect type of heater for your home. Our kerosene heater reviews give you an idea of some of the different kinds of kerosene heaters that you could choose from.